A garage door safety cable is a cable attached to your garage door frame at one end, and attached to your garage door springs at the other. Their purpose? To keep your garage door springs from flying around your garage and wreaking havoc if they should break. Garage door springs constantly have an immense amount of pressure on them from your garage door. They are also constantly battered by the weather, even when your garage door is closed. Unless your garage is door and the rest of your garage is well insulated and sealed, then even humidity attacks them. Garage door springs are even worn down by temperature changes. The chance that one will break is already high. Can you imagine a garage door spring breaking and hitting someone or something at high velocity? Good, because that is exactly what will happen without garage door safety cables. You need garage door safety cables to prevent damage to your car or truck, as well as to the rest of your garage. Not to mention other items that are likely in your garage like tools and washing machines. A car windshield can cost up to $450 to replace and that might not be the only thing that needs replaced. A good laundry dryer costs $500 and up! Did we mention personal injury? Have you considered that a garage door spring at the right speed and projectile path could sever someone’s leg off? When that spring breaks, there is going to be a sharp end and it will be moving quickly. Forget property damages, you could be paying hospital bills for decades, if not for a funeral. There really is no good reason not to have garage door safety cables installed, immediately. It could save your life, your family’s lives and you a lot of headache in general. Don’t DIY Your Garage Door Safety Cables! Yes, it is possible for you to put these on yourself. However, heaven forbid you don’t put them on quite right. Even if you do eventually get them right, it may take a lot of trial and error. That error could cost you money and health. There is a much simpler solution to having garage door safety cables installed. It is a much safer idea than doing it yourself. Unless you are very handy with garage doors. Like we are. 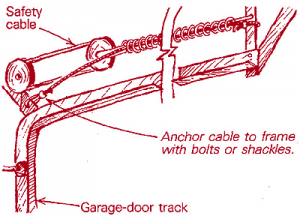 The garage door safety cable will prevent the spring from flying across the garage if it breaks. A spring will only break when it is under pressure, and that is when it is most dangerous. We have proudly provided garage door repair, maintenance and installation services for many years. We are a trusted name that offers great low prices for our garage door services. All you have to do is call (877) 622-8183 right now and we will get your garage door safety cables installed. The best part? We will do it the same day. Maybe you have aging garage door safety cables and need them replaced. We can just as easily do that, too. 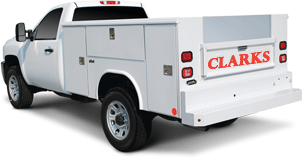 Just remember the name Clarks Garage Door & Gate Repair. It will save you a lot of time and money.